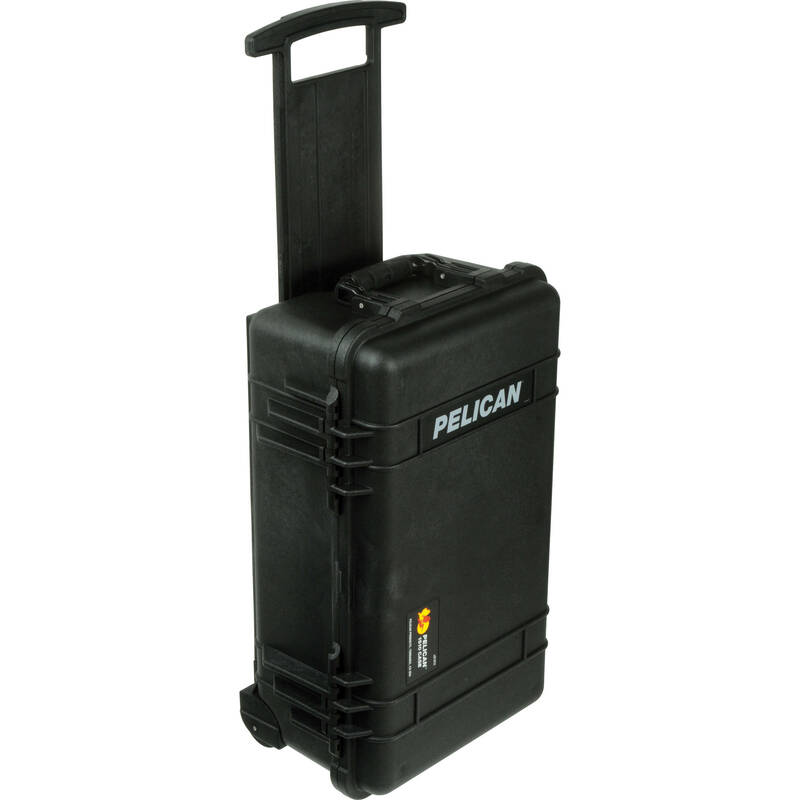 The Pelican 1510NF Carry-On Case in black is an unbreakable, watertight, airtight, dustproof, chemical-resistant and corrosion proof hard case that can be used to carry and protect your equipment from the elements. It is made from ultra high-impact structural copolymer for strength and durability. It has a 0.25" neoprene O-ring, and includes an automatic purge valve for quick equalization after changes in atmospheric pressure. It has a hinged case with double ABS latches that seal perfectly and padlock protectors that provide added strength and extra security against cutting and theft. The 1510NF comes with long side handles, a long front handle, retractable extension handle and strong polyurethane wheels with stainless steel bearings. It has a release latch for the extension handle and meets current FAA requirements for carry on luggage. Box Dimensions (LxWxH) 23.0 x 14.0 x 8.8"
1510NF Carry-On Case (Black) is rated 4.9 out of 5 by 88. Rated 5 out of 5 by Bob the Trainer from Great Carry On Case I use this case to haul gear I need to teach classes onsite. A hard-shell case is ideal for me because with it I am confident that nothing inside will be crushed by other people carelessly cramming stuff into an airplane overhead bin. This one replaces a Pelican case I recently purchased that was billed as carry-on size, but is actually too big. I like the very substantial hinges and latches, and the fact that the padlock points are reinforced with metal, which might slow down a thief thinking about cutting off the locks. The wheels are a little hard; I'd like to see softer urethane wheels used instead. Rated 5 out of 5 by Drew from Great case! I travel w/ bands both nationally and internationally and I carry all of my mics with me. Who can trust what goes on in the belly of the plane these days. With the airlines charging for extra baggage I feel safer taking my gear with me. If it needs to be checked in it is safe with an added TSA lock. For a carry on case that is tough and VERY functional I highly recommend it. The fact that it is the largest cary on case that's water tight with wheels and a handle that extends you can not go wrong. The only thing I find wrong with it is that I might have to get another one. Rated 5 out of 5 by Roadie Reid from The name says it all Pelican is a world renowned name and a name of excellence. I don't know how to explain to somewhat what your investing in when you buy a Pelican case. Usually that is not an issue however because anyone who had even been to a wedding or any other type of photo shoot had seen these professional cases. I love the sturdiness of my Pelican and how you can feel the strength and rigidity of the case when you pull it open. The day my Pelican 1510 case I climbed up on the roof in the rain and threw it off. The case fell two storues, hit the ground and almost started laughing at me. Moral of the story- buy Pelican from BHP. Rated 5 out of 5 by Chief from Survived to fight another day! On a recent cross-country trip I had an unfortunate encounter with a deer. The camera gear survived the encounter with no issues; the truck and sadly the deer were not so fortunate. I kept my photography gear in a dedicated photo backpack for years and was never really pleased with the system. It's not that hook and loop Velcro does not have its uses, but fighting with it when reconfiguring my backpack was always a pain in the ^%$. I considered a hard case frequently, but as a self-professed neat freak I was not a fan of the pick-n-pluck foam or the typical irregular cuts in blank foam pads. TREKPAK solved all of my issues. The TREKPAK system provides excellent protection for my gear, it's neat and tidy and easily reconfigurable. I am so impressed with the TREKPAK system I ordered a second Pelican case and TREKPAK 1510 insert. I also purchased extra pin set, dividers and lens pads. These items are relatively inexpensive and allow for quick reconfiguration. Rated 5 out of 5 by Anonymous from More Room than I Imagined I had purchased a cheaper knock-off case and regretted that decision. The Pelican 1510 case is an excellent product with more room for cameras, lenses and other items than I thought. I highly recommend the 1515 padded divider rather than the pick and pluck foam. The foam eventually comes apart; the padded divider can be reconfigured to changing needs of the photo shoot. I can pack 3 FX bodies (Nikon D3x, D700, D800), the 17-35 f2.8, Tamron 24-70, f2.8, Tamron 70-200, f2.8, Nikkor 50, f1.8 AF-D, flashes: SB 900, SB700, camera straps, and a box of rechargeable batteries. If I remove one camera and the 70-200 lens, I can pack the 200-500 lens. The wheels and pull handle are a nice feature as well. This case is highly recommended. Rated 5 out of 5 by Anonymous from There are no better cases for ur stuff! I've seen this product used for Military, Fire, Police, & Coast Guard, that's why we picked it. They're a tough, pressure sealed, waterproof, no nonsense form factor that can hold anything. We use it to house portable alternate energy generators & equipment. You can lock it with a padlock (two locks if you're really into locking stuff up). It comes in different colors (good for classification purposes but we use black as default). They can seem a little pricey at first but when you see the quality of these you'll know you're getting your monies worth. Rated 5 out of 5 by Dora the amateur explorer from Great protection for expensive equipment This is my first Pelican case and I am very happy with it. Because the weight of my camera and lens is to much for me to carry during long trips, I opted to packed these equipments in my Lowepro Backpack then packed the backpack inside the Pelican case for luggage check in. The Lowepro Flipside 200 Backpack fits snuggly inside this case and has a some room for additional items such as a back up camera and other accessaries. I had no problem with my equipments after a round-trip to India from USA, with multiple handling by bus drivers and tour guides when transporting the case on and off the tour buses. In India, the luggages are sometime placed on top of the bus. With Pelican, I did not worry at all. This allow me to carry whatever equipment I needed at the time and leave the rest well protected in the Pelican case that is locked with a TSA Triple Security Cable Lock. With the sturdy construction, I also usee the case as a seat while waiting in crowded Indian airports waiting to check-in delayed flights. If a tractor/truck cannot crush a Pelican case, then my weight on the case is certainly safe. Rated 5 out of 5 by Dustin DIll from Amazing buy I am a professional wedding videographer, have a couple of destinations weddings this year and needed a carry on. I have to say it's a pretty awesome case, the sleek design, durability and the weight is perfect. I looked into the pelican 1510air and found this case to be more durable. I can fit all kinds of things, c100, 4 lenses, audio, two mini lights etc. I also went with the trek pal inserts best money I spent this year. Will this fit under airplane seats? The 1510 is about the size of a carry-on suitcase. I have already used it as carry-on on a couple of flights with absolutely no problems. Measures 37.5 floor to top of extended handle, when upright. I can personilize my name in the box?